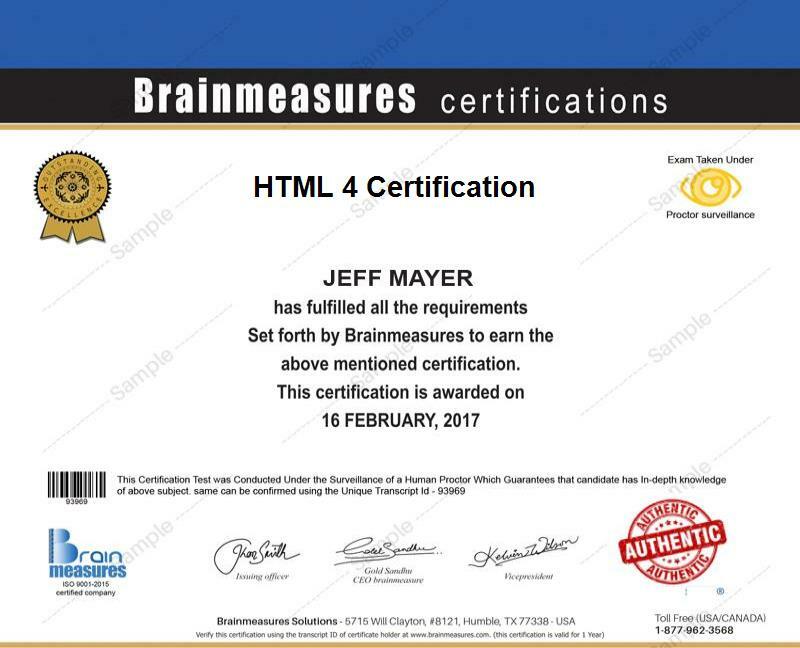 If you want to know more about what is HTML 4 and how it works, then the HTML 4 certification program which you can now access at Brainmeasures is a huge help. This HTML course from Brainmeasures is a major help in your attempt to get a web development training which covers HTML in the most detailed manner possible. The HTML training that you can get from the online certification course is guaranteed to improve your skills when it comes to operating HTML and understanding all its major functions and elements. Enrolling in the HTML 4 certification course offered by Brainmeasures is definitely the most effective ways to learn HTML online considering its ability to instill in your mind everything that you need to learn about it. The reliability, accuracy and comprehensiveness of this online certification course make it one of the most reliable IT certification courses offered by the company. In order for you to finally take a hold of your HTML certificate, you need to pass the online HTML exam which is a huge part of the program and is primarily designed to help assess the level of your skills and knowledge in the field. Different individuals and professionals especially those who are working in the IT industry can greatly benefit from enrolling in the HTML 4 certification course offered by Brainmeasures. This is extremely beneficial for IT professionals especially web developers whose daily responsibilities involve the use of HTML 4 and its semantic, structural and form tags. It can also benefit professionals who want to start using HTML 4 in creating contents for web pages including drawings, tables, audios and videos. As an HTML 4 certification holder, it will never be impossible for you to get hired in positions that offer higher pay. If you complete your HTML 4 certification course and decide to work as a software engineer, then you can expect to start earning an average annual salary of $88,000. Being a web developer, on the other hand, gives you the opportunity to earn around $72,000 per year. There are still a lot of positions that require the expertise of HTML 4 experts and you can expect all these positions to help improve your financial stability.